Back by popular demand… our deliciously fun chefs event! 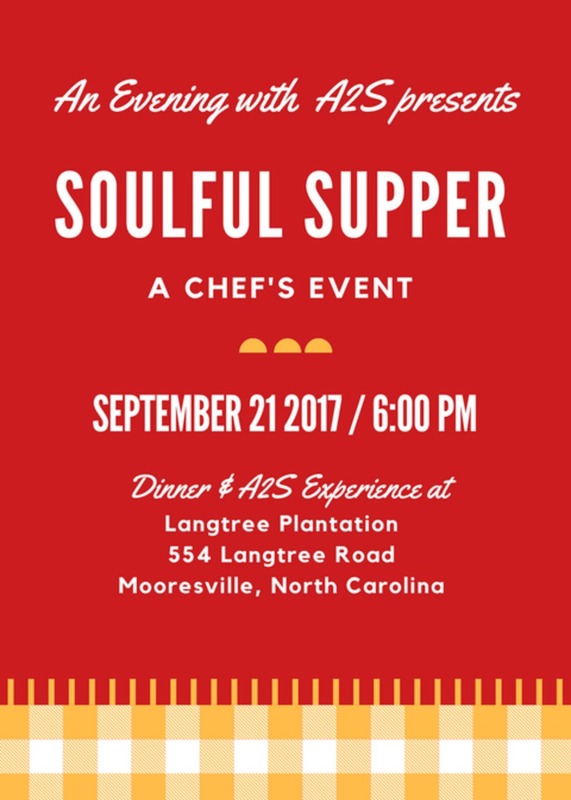 Join Access to Success on Thursday, September 21, 2017 at 6 p.m. for our annual benefit dinner Soulful Supper, A Chef’s Event, featuring Joe Kindred (Kindred Restaurant, Davidson, N.C.), Cody Suddreth (Rooster's Wood-Fired Kitchen, Charlotte, N.C.) and Geoff Schneider (The Peddler Steakhouse, Greenville, S.C.). Hello, Sailor (Cornelius, N.C.), Bruce Moffett of Moffett Group (Barrington's Restaurant, Good Food on Montford and Stagioni: Four Seasons of Food of Charlotte, N.C.), and Troy Gagliardo (WU's Cajun Sea Food) (Charlotte, N.C.) have joined the exciting lineup, and beer, wine and coffee will be provided by D9 Brewing Company (Cornelius, N.C.), Free Range Brewing (Charlotte, N.C.), Childress Vineyards (Lexington, N.C.) and Sycamore Coffee (Mooresville, N.C.). An Evening with A2S is the annual benefit dinner to support A2S programming. A2S is an international, education nonprofit that provides sustainable programs that generate positive change for Nigerian children and their community. The evening will include hands-on experiences to share about A2S programs in Nigeria - including our Basketball & Empowerment Camp, the Entrepreneurship Incubator and the After School Academy, as well as music and silent and live auctions. Sponsored by Coca-Cola Bottling Company Consolidated, Carolina Pet Place, Independence Consulting, Unity Presbyterian Church and The Richards Group, Keller Williams Realty. Along with the chefs, Davidson College Head Men’s Basketball Coach (and 2017 trip participant!) Bob McKillop will hold an exclusive, intimate meet-and-greet prior to the main event. Coach McKillop will share his experiences from the trip, and the chefs will share their background and how they became involved with A2S. Tickets are limited, but available at no extra charge. The meet-and-greet will begin at 5 p.m. at the Stone Lodge at Langtree Plantation, and is sponsored by Moore and Van Allen. Purchase your tickets today! Tickets are $100 and will increase to $125 on September 1. Sponsorship opportunities are also available. Please contact grace@a2sfoundation.org for more information. Tickets are limited for this special pre-event! Consider reserving your spot early. Pre-event will begin at 5 p.m. followed by the dinner.